Home and building automation is the most hyped technology in recent times. The market is witnessing lot of excitement even on singular products that address one aspect or a subset of home automation. Many big brands are in a rush to acquire and present different products to the consumer to solve different automation use cases. The result is that the consumers have a plethora of different apps to setup, learn and use. The varied apps have different look and feel and have a steep learning curve for the user experience. Another problem is that all these products may not work on a unified technology, since these products have adopted disparate technologies such as Wi-Fi, ZigBee, ZWave, BLE and more. But a true home automation is not about offering a singular solution for access control or temperature control; it is about an integrated platform that unifies devices, mobile applications, cloud services and data analytics, with an overlay of a consistent, easy-to-use interface. It should not only give the customer the ability to control appliances individually, but also enable the customer to manage, monitor and control the entire set of home appliances from a single user interface. Orvito was incorporated with a clear vision and an aspiration to create integrated platform that unifies devices, mobile applications, cloud services, and data analytics, with an overlay of a consistent, easy-to-use interface. In commitment to this vision we have developed an innovative integrated IoT platform – Orvito Nucleo™. Nucleo offers end products such as Smart Switch Panel, Video Door Phone, Safety Sensors, Surveillance Cameras working with a single Hub, which also functions as a core command center. The platform also provides a cloud-based infrastructure for unified control, monitoring and analysis of residential, enterprise, retail, institutional, commercial or industrial facility. 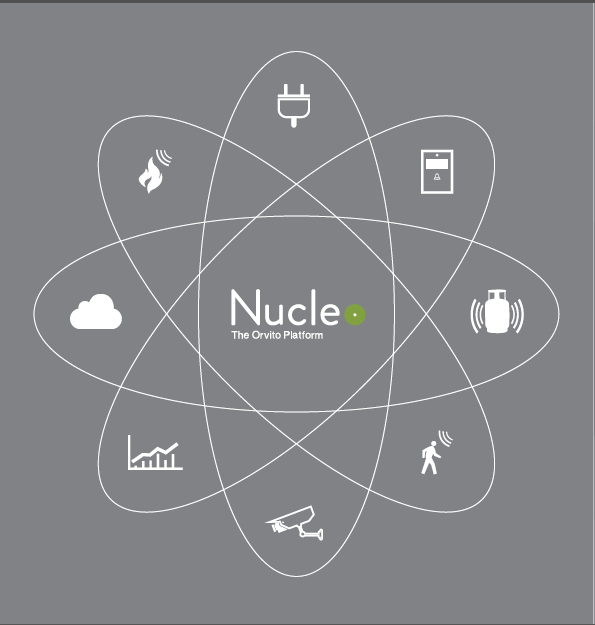 Nucleo uses well documented API’s to enable third party devices to integrate and provide a consistent user experience. Orvito has launched world’s first touch Smart Switch Panel that is built for a global market. The Smart Switch Panel replaces the existing switch panels in the home and has the capability to truly automate a facility in matter of minutes. Zero requirement of extra wiring makes the installation completely hassle free. All our design and development choices and decisions have been predicated on a single guiding principle – seamless connectivity & communication to revolutionize the IoT industry and build a truly smart home or enterprise. In our quest to bring in fundamental change in smart home ecosystem we looked at an appliance where there has been no innovation for the longest time but has the potential to bring in technology that can change the way we live. And that was the Switch Panel! Orvito Smart Switch Panel™ allows control of all types of electrical home appliances anytime, anywhere. It is a wireless networked element primed for controlling devices, triggering presets, sensing motion and optimizing energy consumption. We have ensured that the consumer facing interface is very similar to the real world. We have not tried to put the computer on the wall but have replicated the same usage pattern that everyone has been using for years. The product has been piloted worldwide and it meets the harshest working requirements like unreliable network, power surges etc. We are a global company, and have variants to suit country specific standards. Our SSP ranges from 2 circuit switch panel to 8 circuit switch panel to cater to the needs of US, Europe, Africa, Middle East and South Asia.. This is our first product from our innovative IoT platform Orvito Nucleo™. We are poised to serve home, enterprise and hospitality segment. We offer not only convenience through our SSP but very soon we will be launching a suite of products providing safety and security as well. Headquartered in Massachusetts, USA, Orvito operates in North America, South Asia and Africa. With a strong network of distributors, partners, direct sales force and after sales support team, Orvito enables smooth installation and service of products.